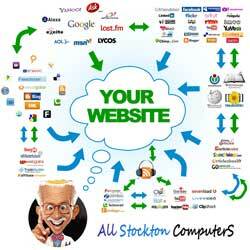 All Stockton Computers works with the best in the business to bring cutting edge SEO to your website!! People are searching for you right now…not in the sky, but online…mostly via search engines.In order to get your web pages noticed by search engines, it helps it you know what they like! But wait, there’s more! In addition to making your site itself ‘search-friendly’ you need to know about off-site factors that can help you increase your search engine rankings. I have also had a long time web marketing and web development mentor in Josh Sloan of Sloan Tech. Josh handles the Internet Marketing and SEO for our clients these days as he is a seasoned pro and waaaay ahead of the curve in his web marketing/SEO/social media niche. That’s how you found us!! I work with Josh to find the best approach for my clients and we go from there. Regardless of whether you are a local business seeking to rank for local search keywords or a national or international company looking for global traffic – let us help! Try one of our Search Engine marketing services.